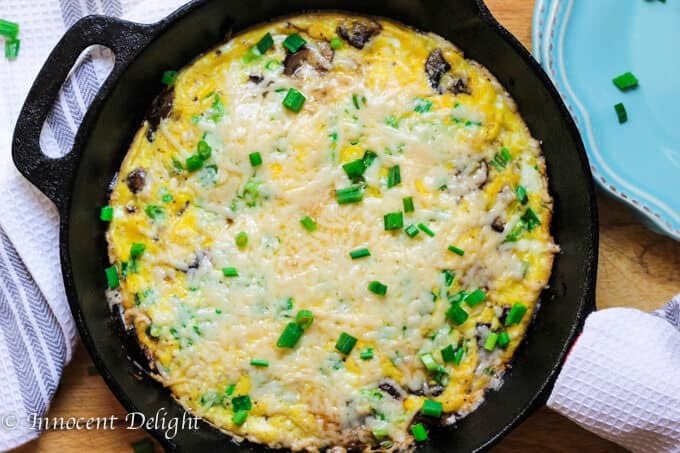 Mushroom Scallion Frittata with Parmesan Cheese – Italian inspired dish that can be served for breakfast, lunch or dinner. It seems like Italians know what they’re doing. Having eggs for lunch or dinner? Why not. I’ll take that. 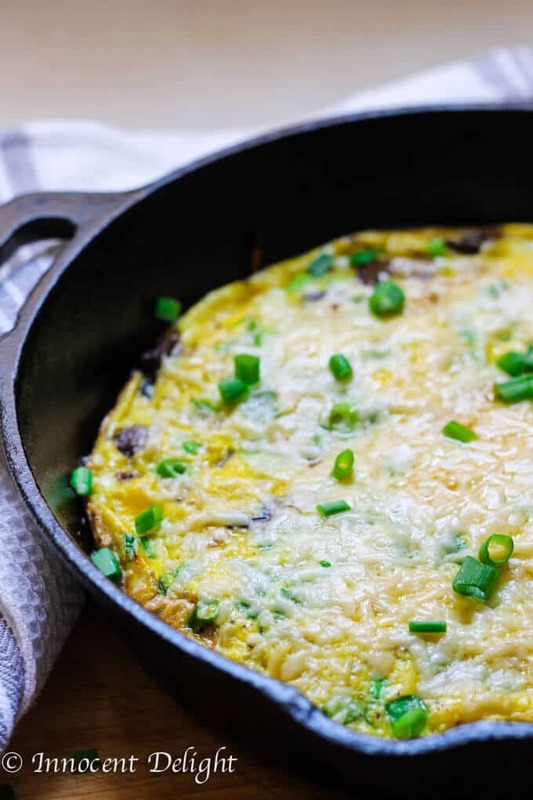 This Mushroom Scallion Frittata with Parmesan Cheese can be served at any meal. It only requires few ingredients and half an hour of prep time. How easy is that? I’ll be honest here, having eggs for dinner is not a new concept for me. Actually it’s a very common dinner in Poland on Fridays: mashed potatoes, fried sunny side eggs and some veggie on a side. Traditionally in Poland people don’t eat meat on Fridays. It comes from the Christian tradition but it seems like it was popular among non religious folks as well. We would often have pierogies, creps with cheese, potato pancakes, fish or fried eggs. Yep, fried eggs for dinner. My husband thinks that it is totally crazy. But apparently other nations are consuming eggs for lunch or dinner as well. French put poached egg on their frisee salad, Japanese put quail eggs on sushi, Spanish eat their egg – potato tortilla as tapas. I’m sure I could find more examples if dig a little more. I guess you get my point. It’s totally fine to have eggs for dinner. 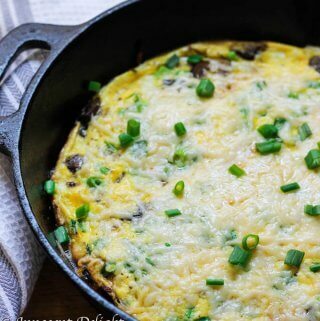 You can start with this Mushroom Scallion Frittata with Parmesan Cheese and serve it with a side of green salad. We ate this for brunch one weekend and I know that if I tried to serve it for dinner, the first question I would hear from my husband is: where is the meat??? 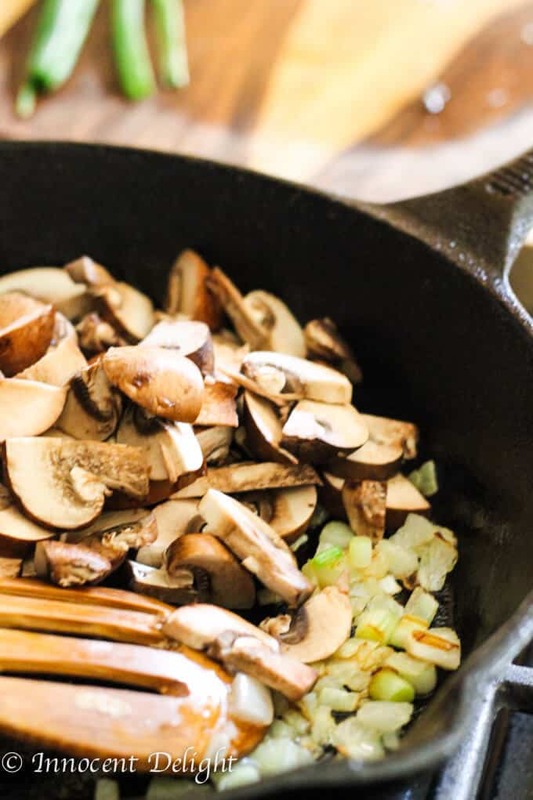 So even though I couldn’t serve it for dinner in my house, I am encouraging you to try it and if your loved once are open for some vegetarian treat, by all means serve it to them. It’s so damn good. 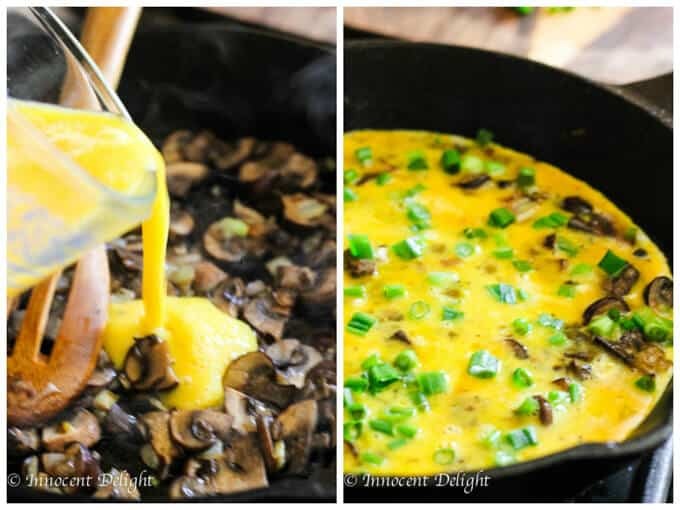 Now that I’m thinking about it, I remember that one time my husband had mushroom frittata and avocado salad for dinner and he was not complaining. We went to Dominican Republic to spend a week with my father in law and his loving wife. She takes really good care of her husband and makes sure that he eats a healthy diet. Therefore few times a week they have a vegetarian dish. We arrived to Punta Cana and dad told us that we are having a vegetarian dinner: mushroom frittata and avocado salad. We all loved it. It was delicious and super light. Perfect meal for summer vacation finished with a glass of good Sauvignon Blanc. Oh my… I want to go back to Punta Cana right now…. 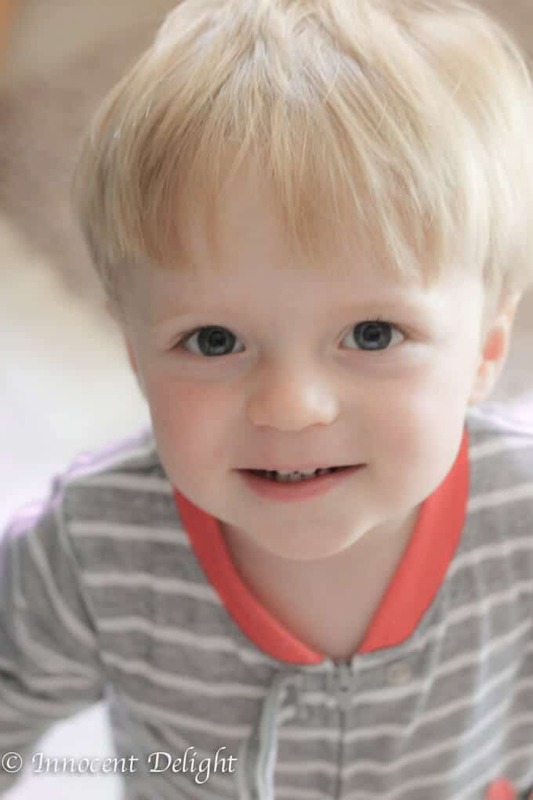 And here is my little sunshine coming into the kitchen in his PJs curious what is mommy cooking this morning. 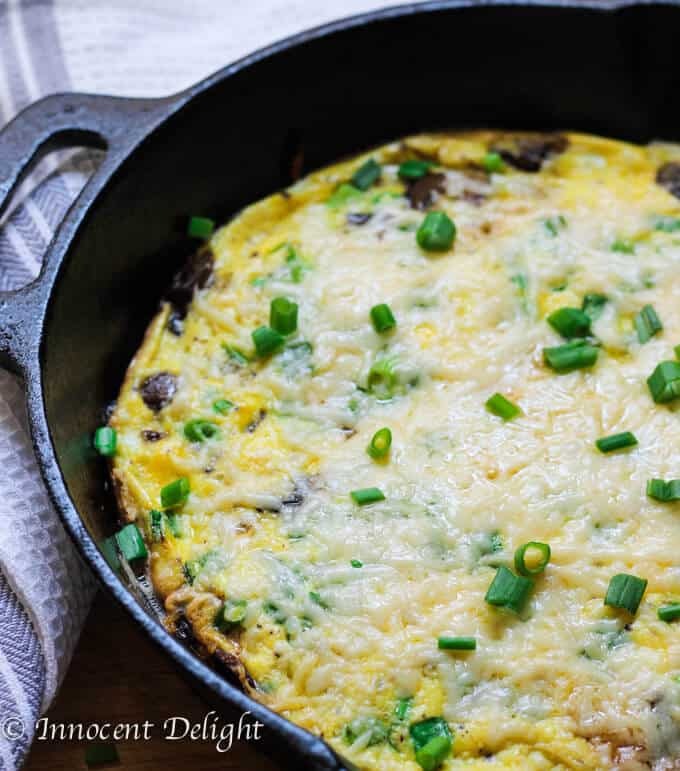 Mushroom Scallion Frittata with Parmesan Cheese, my love. 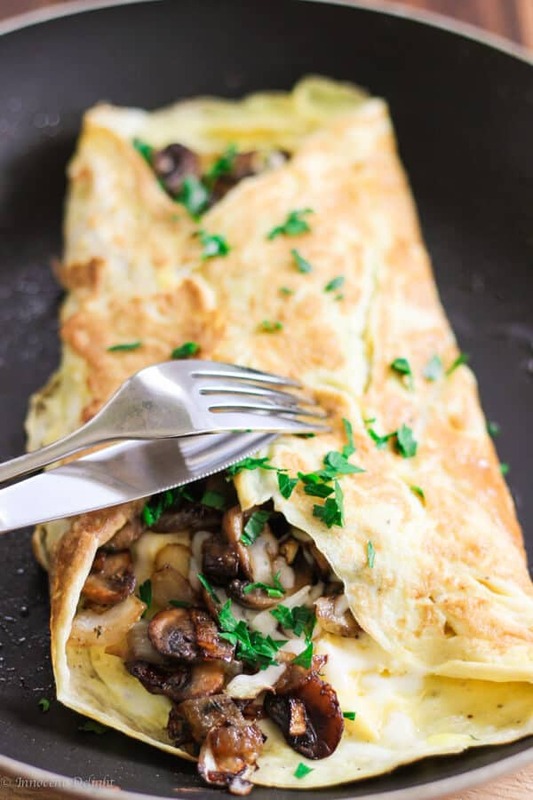 Sprinkle the cheese and let cook for another 10 minutes until the eggs are cooked through and the cheese melted.